Pilates is an exercise that involves working out on a mat on the floor, or by using equipment known as a reformer. Pilates exercise is low impact and is suitable for most people (check with your health professional) and can also help with gradual weight loss. This low-impact exercise can be done around twice to three times every week. It can also alternate your exercise sessions with yoga or other strength training exercises for faster results in weight loss. The exercises in Pilates assist in the toning of muscles, particularly the middle areas of the body. Your body becomes toned using various Pilates techniques and you gradually see a slimmer appearance. Most of the people who work towards losing weight look forward to a slimmer body and this low-impact working out can help you achieve that goal. Losing weight can help you to develop the physical ability to exercise. Many people who are overweight struggle with weight loss exercises. As per the findings of the exercise experts, Pilates exercise is excellent for developing the required strength and flexibility as well as toning your body. Pilates exercises can help lighten back pain making you exercise session easier and comfortable. Once you build up your muscles you should be able to do more exercises with utmost comfort and minimal difficulty. The low impact exercises give you a smooth introduction to the routine of movements. These exercises also help you achieve good balance. Good balance enables you to move easily and often more quickly. This allows you to focus more on exercises that you enjoy and can do comfortably. Once you can move easily losing weight becomes very achievable. Pilates exercise can benefit the body as well as the spirit and mind. It can help you achieve a positive perspective on the journey of weight loss and this may help you lose more weight quickly and for the long term. A positive attitude and a rejuvenated spirit are crucial for your overall well-being. You learn how to give each exercise total attention and how to maintain a high level of focus. Performing these exercises involves flexible and graceful movements, and this can assist you in your daily routines by boosting your poise and coordination. Pilates helps increase your muscle power and flexibility resulting in safe and graceful movements. You continuously take full and deep breaths while exercising and this can help to reduce stress, and increase performance in sports. Pilates exercises are an essential part of the weight loss journey for all people. You can achieve not only a more toned body and also a healthy state of mind and a positive outlook on a healthy lifestyle. Back pain is a discomfort by a person along the spinal cord due to injury, lifting of heavy loads or any other strenuous activities. This might either be the whole spinal cord (which might be life-threatening) or sections like the lower back pain (buttocks, upper thighs and groin areas), the middle back pain or thoracic spins (lumber and cervical areas) or the upper back pain (neck and shoulders). Trigenics specialists are all over the town and can be any chiropractor Applecross has. It is a form of neuromuscular treatment that uses physical means to correct body tissues. The main aim is to improve relaying of information between the brain and other body parts. The treatment is gentle and acts immediately to relieve pain, improve muscle performance and recuperate muscles. It is similar to chiropractic methods and has gained much impact among osteopaths, masseuse and physiotherapists. Being at the centre of the neurological system, the spine is the main communication channel of the body. Any information relayed from the lower body part has to go through the spine. If there were to have a torn tendon, muscle or ligament damage, then these impulses might be distorted. Trigenics treatment works in three folds to mend this breakdown by increasing the stimuli generated to create the actual response intended. This includes frequent movement of the patient. The chiropractor then restricts movement on specific muscles which sends impulses to the brain. This treatment requires the doctor to directly apply pressure on the muscle, tendon or ligament by either traction or rhythmic sensations. It stimulates the nerves to send the impulses to the brain. This is a controlled breathing exercise as the doctor instructs what to focus on to improve the body’s sensations. This is a direct feedback mechanism that offers therapy to the muscles to improve the response rate of the body’s neurology. Another treatment is the spinal manipulative therapy. This is the movement of the spinal joint brought about by exercise, massage and physical therapy. It relieves pressure on the joints and improves the nervous functions. Lifestyle advice is also a good preventive method to overcome back pain. This touches on sitting posture, being active and exercising regularly. If these physical activities prove too tedious, the doctor might advise nutrition supplements, a change in diet or electrical stimulation. The process tries to reconfigure the communication between the central nervous system and the rest of the body. Also, it increases flexibility and body strength. This is done by stimulating the nerve sensors in targeted muscles to align the said muscles to normality. The variety of chiropractor Applecross has can effectively handle such conditions. 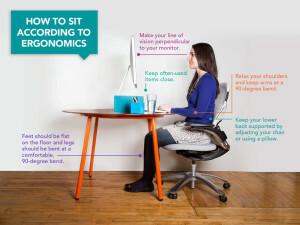 Maintain an upright sitting posture slightly slanted towards a 10°-20 ° angle. Always make sure that your wrists are stretched out especially when you are typing. It is however not advisable to sit for long periods since it can result in numerous health complications like obesity and high blood pressure. Therefore, it is sometimes useful to use to a standing working station. Make sure your head, torso and legs are aligned in an approximately straight line. When you want to shift weight from one leg to another, use a footrest. When typing make sure that the keyboard is as close to you as possible and placed in a central position. You can adjust the keyboard’s position depending on the side you use most whether it is the alphabets or numerical side. The Mouse should also be placed as close to you as possible so as to prevent pain that comes with too much stretching. Using mouse pads that have wrist support might actually go a long way in reducing strain on the wrist and elbow. When sitting on a chair, an Ealing Chiropractor, Mat Atkinson highly recommends that you adjust your seat properly so as to allow your feet to rest flat on the floor. Here footrests could be of great importance if there is difficultly in doing so. For your back, the chair should be slightly slanted towards a 10°-20° angle from the vertical position. For your arms, it is important to have arm rests when working. However, if the arm rests are not adjustable to ensure that your shoulders are also relaxed when resting your arms it is important to get rid of them. This is because they will cause damage and pain to your shoulders and upper body. Musculoskeletal complications are really serious and each and every precaution should be taken in order to reduce such cases and/or do away with them. Since office workers are the most affected good working postures should be adopted in the office at all times. Proper positioning of keyboards, mouse and other equipment is also critical. Apart from observing all of these it is important to get chiropractic treatment regularly. If one is England an Ealing Chiropractor can be of great help. This goes a long way in preventing any further damage and getting remedies as soon as possible.